Vigoda has been playing guys with one foot in the grave since the ’70s, but Harry Morgan has been looking old on TV since 1966 and he’s still alive, too. Where’s his parade? 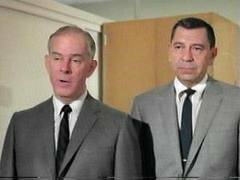 Well, Harry Morgan passed away in Dec. 2011, and I still say he went out as the all-time champion in the old-looking guys who are still alive category. When 2012 began, we still had Ernest Borgnine, Andy Griffith, and Jack Klugman giving Vigoda a run for his money. We said goodbye to Borgnine and Griffith in the first part of the year. But for my money, Jack Klugman was always the dark horse in the race. From his Twilight Zone appearances to the Odd Couple, he made a living playing guys who seemed destined to die in their fifties. Who could have dared imagine that Oscar would outlive Felix Unger by nearly a decade? Yet, as 2012 wound down to a close, Jack Klugman was still here, while Tony Randall had passed away in 2004. It seemed the cigar-voiced Klugman might just be indestructible. But as we learned on Christmas Eve 2012, this was not the case. Klugman went to his reward at the age of 90. Abe Vigoda is the only one left. 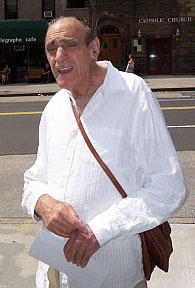 In 2013, when we celebrate Vigoda’s “still living” status, it’s a little more poignant than it was 13 months ago.